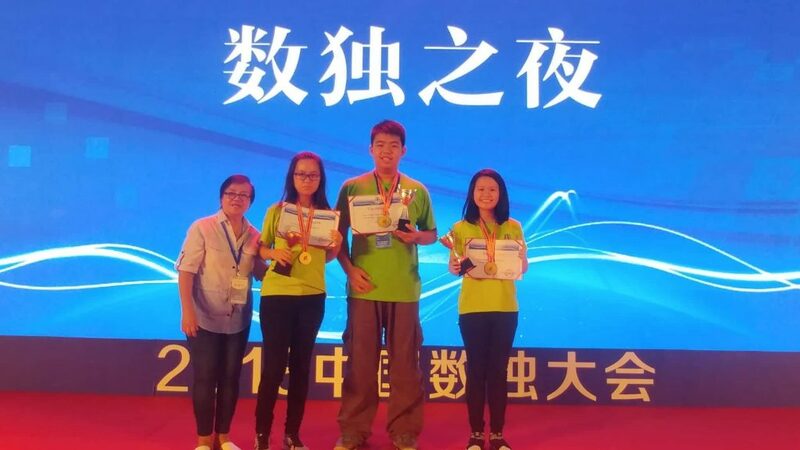 The three Philippine Sudoku puzzlers were on the top places winning silver and bronze medals in the 2018 China Junior Sudoku Championship held in Beijing, China on August 9 to 12, 2018. Wrestling with the finest Sudoku aces mostly from the various provinces of China, Korea, and Japan, our Filipino Sudoku stars were forced to unleash their special speed-accuracy tactics to enhance the Philippine medal chances. As a result, Jonathan Conrad Yu from University of San Carlos – North Campus (Cebu), and Kirsten Dominique Chan from Bayanihan Institute – Tarlac succeeded to bring home a silver medal each while Bernadette Concepcion also from Bayanihan Institute secured her bronze medal. Other than winning a medal, our Filipino Sudoku puzzlers also held the country’s first trophy from the contest. Our participants joined the Under 18 category solving the following puzzles 6 × 6 Dots-Kropki Sudoku, 6 × 6 Skyscrapers Sudoku, Standard Sudoku, 9 × 9 Diagonal Sudoku, 9 × 9 Irregular Sudoku, 9 × 9 Killer Sudoku, 9 × 9 Consecutive Sudoku in four rounds for the individual contest and three rounds for team contest. This entry was posted in Announcements, News article on August 14, 2018 by admin.